– The walled garden didn’t work for them, and it won’t work for Facebook either. It’s a mindset that says ”we’re not really interested in our users”. 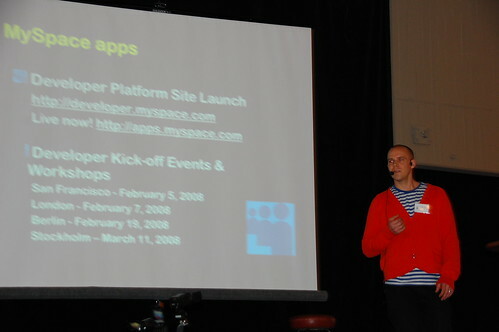 Jonas Nyvang from MySpace talked a bit about MySpace apps and Open Social. – We give 100% of the revenues you can get from the app you develop. We’ve been pioneering the monetization of social networking. Like when Arna and I met him in september last year, he doesn’t want to see Facebook as a threat. He makes this distinction between MySpace and Facebook. – Facebook is more about the social graph, while MySpace is more about your interests, what you strive for and your passions. His/MySpace’s view of how the web is evolving isn’t new. It is becoming more personal, more portable and more collaborative. 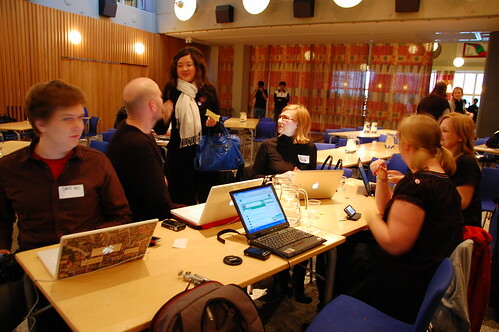 The usual crowd has shown up for Facebook Garage Stockholm, the third event organized by Nustart in Stockholm. The focus is on Facebook, but also social networking sites in general and their development. The first speaker is from MySpace, for instance. 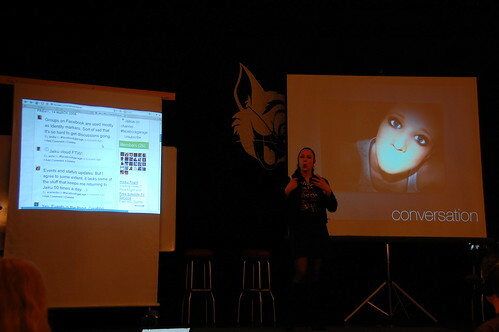 – This is an audience-generated event, says moderator Beata Wickbom. That’s what sets these Nustart events apart. Things like backchannels have become an integral part of the events. The Canadian defence department has sent a memo to soldiers, urging them not to use social networking sites like Facebook, writes CBC News. The reason is said to be that terror organizations like Al Qaeda are monitoring these sites and any details revealed by soldiers might compromise missions and potentially threat the safety of the soldiers and also their families. There are many areas where transparency is a good thing. In some ways, this isn’t one of them. At the same time, social media or indeed citizen journalism is one of the few ways to really find out what’s happening in troubled areas like Afghanistan or Iraq. Wherever wrongs are being committed by either side, I for one hope the soldiers are brave enough to go public with it through the media – citizen or traditional – so that we don’t get another Abu Ghraib scandal. Anyone with a still or video camera in public is immediately suspected as a ”trouble-maker.” This endangers our right to click and shoot for personal or professional purposes. Luckily, the vegetable sellers came to her rescue. ”They… said they asked me to come with the camera to take some photographs of them,” she wrote.